iPower is one of the leading manufacturers of grow light systems, supplying the gardeners worldwide for over a decade. Our goal is to put a light in every garden where needed. From hobbyist to commercial applications, we offer a broad spectrum of garden tools and equipment in hydroponics, irrigation, climate control, and structures to help your garden thrive. iPower Double Ended 1000 Watt MH Bulb is NEW improved horticulture lamps use super high output technology to achieve maximum vegetative growth and maximum flower yield. 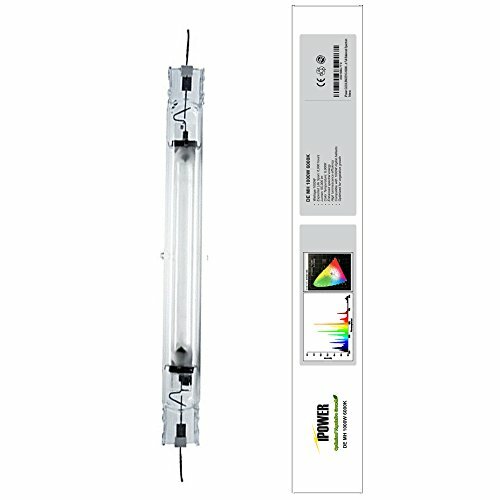 These bulbs are designed to produce excellent quality and high performance lighting from both ends to achieve an even distribution of illumination throughout your grow space. New long lasting life with a high lumen output and low energy consumption. For the environmentally conscious, iPower double ended bulbs are the ideal economic solution with longer average life, high lumen output, and ideally low energy consumption compared to conventional lighting.